This image shows the different dental lasers on the bottom each in their respective wavelength. The Periolase is an ND:Yag with a wavelength of 1064 nm. 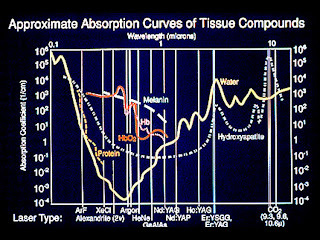 The lines on the graph show the absorption in each of the different tissues. Notice that Melanin, Hb (Hemoglobin), and HbO2 (Oxigenated hemoglobin) completely disappear at about 1100 nm. This correlates to the increase in absorption in water once the wavelength is absorbed in water the rest of the tissues stop absorbing the energy. Therefore the ND:Yag is highly absorbed in Melanin. Dark pigmented anaerobic bacteria are full of Melanin. Dark pigmented bacteria have been postulated as being the primary bacteria responsible for Periodontitis. This includes lot of interesting information which is really useful to everyone.Laser gum treatment is an advanced, minimally invasive technique used to treat periodontal disease and save many teeth that were previously considered hopeless. Laser gum therapy is a unique alternative to traditional gum surgery, and has many benefits to the patient, including a quicker, more comfortable procedure, no incisions, and fast healing time.